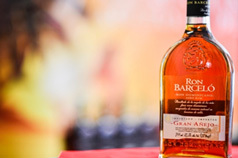 The main focus is currently on the surprisingly different Bachmann Herbal Liqueur and the Mallorcan Orange Liqueur Angel d’Or. With new bottles and label designs, the two brands will be making their mark this year with a classy new appearance. 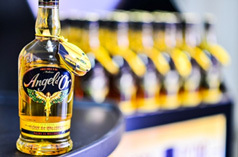 Angel d’Or also has had some exciting new nuances added to its recipe for an even greater taste. Among other successful international brands that Friedrich Schwarze has brought to Germany are Vodka Koskenkorva 013 – distilled with barley, and a leading brand in its home country of Finland, the Kentucky Whiskey John B. Stetson and from the Dominican Republic Ron Barceló Premium Rum. Looking back on what is now a 350-year company history, the motto for Schwarze und Schlichte and the developments in the company would appear to be “Brands, People and Milestones”. The milestones are, of course, the company traditions that are preserved and nurtured with a real passion for detail. Honouring the family inheritance, ensuring honest partnerships and good employee relations, and listening to the customer and reacting to meet their requirements are, however, equally important components of the company philosophy. The company places great importance on never forgetting to look to the future: setting new trends with new brands at the right moment, acquiring exciting new products, and reshaping and further developing other brands. The first product that acted as a real driving force was Frühstückskorn. But when sales of this product continued to decline due to changing consumer habits, the company was quick to realize that another leading product would have to be established for the future. This was, however, something that could not be done overnight. So the company won time and breathing space by acquiring selected famous brands such as Schlichte, Dujardin, Bärenjäger, Bachmann, Sechsämter and Folts, and developing its own new brands such as Angel d’Or and Stetson until a worthy successor to Frühstückskorn could be found and firmly established. This goal was then achieved by purchasing the brand Three Sixty Vodka. And it is as true as ever that only with a full range of powerful brands can a successful future for the company be ensured. The first documented holder of the name Schwarze, was Joan Schwarze, tax collector and distiller of Korn Schnapps, who lived in Westkirchen. In 1664, “Swartens Hoff und Brennhaus” is first mentioned in church records: in the form of the notification of a fine. Joan Schwarze had picked up corn in his cart from a farmer and as this was not allowed by the church, he had to pay a fine which was recorded in the church documents. The grandson of Joan Schwarze, Joan Hermann Schwarze moved to Oelde in 1738, taking the whole company headquarters with him. Here he acquired civil rights, married the mayor’s daughter, worked as a distiller and thus laid the foundations for the Oelder Kornbrennerei Schwarze, on which the company still stands today. the firewood had to be fetched from far way, peat and coal had a negative effect on the yield and quality of the product, ensuring the right mash temperature was difficult without a thermometer, and the stills needed constant firing. Not to mention bans on distillation due to poor harvests, and a whole range of taxes. 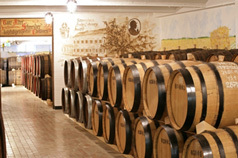 But in the face of all this adversity, Joan Hermann Schwarze succeeded in building up a flourishing trade in barrels. Korn Schnapps was exported in barrels right up to the German Eastern territory of the East Prussian Empire – a most impressive achievement not only because of the enormous distances. The flourishing trade with the East in barrels caught the eye of the state, who took over the entire trade, meaning that the whole of the company’s business suddenly disappeared. The grandson of Joan Hermann Schwarze had no other choice than to concentrate on another way of selling Korn Schnapps that was still permitted: the trade with Korn Schnapps in bottles. Joan Hermann Josef Schwarze thus not only succeeded in keeping the distillery open, but was also able to expand and ship the Korn Schnapps to places as far away as the Ruhr, Münster, Ravensburg and Sauerland regions. In 1836, Gottfried Schwarze (the son of Joan Hermann Josef) travelled to America. After 1½ years he returned to Oelde with a suitcase full of ideas and inspirations. He modernised the distillery, switched the traditional firing of the stills to steam, and built up a profitable business producing yeast. This is why, unlike others at the time, the company was able to survive the strong competition from potato distilleries with lower prices and costs, that destroyed around 50% of the existing Korn Schnapps distilleries in the Münster region. The new railway from Cologne to Minden had also helped to create an economic boom in the region. Not only the male members of the Schwarze family had a keen sense for business and strong work ethics. Even back when Gottfried Schwarze was in America, his mother held the reigns of the business for several years. In his will, Gottfried made his wife Katharina Bernadine Schwarze his successor. She took over the company in 1872 at the age of 56, and despite being a widow in a male-dominated business environment who had already raised four children, she held her own as a highly successful businesswoman for the next 16 years. Among other things, she purchased new distillation and rectification equipment, and also achieved a significant growth in sales, particularly in the Ruhr region. 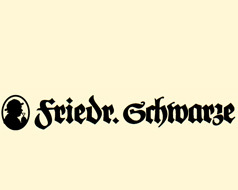 Like other visionary entrepreneurs at the time, Friedrich Schwarze realized how important it is to make a great product distinctive with attractive branding, and thus give it a unique appearance. In 1912 he registered the brand Friedrich Schwarze, and used the farmer silhouette for what is quite literally the company’s trademark. Following the Second World War, it was time to look forward again. In 1947, Wilhelm Schwarze decided to take a brand new approach to sales. This was a brave step but also a very good decision. Instead of only supplying the catering trade via beverage wholesalers, Wilhelm Schwarze saw great potential in the retail grocery trade, and decided to concentrate on supplying this sector. He would, however, need a different sales unit to the large woven bottles for the catering trade. This was when the bottled Schwarze Frühstückskorn was born. The company has always excelled in facing changes head on and reacting in the most flexible and agile way possible. Purchase of several traditional brands from König & Schlichte, and the second major relocation in the history of the company: the entire production was transferred from Oelde to Steinhagen. Once again, the stage was set for the future: after acquiring the spirit business from the company Racke, the third major move took place, involving the complete relocation of the production facilities from Steinhagen to Rinteln. For 350 years now, the spirits producer Schwarze und Schlichte has dedicated itself to the art of high quality distillation. Based in Oelde in Westphalia, the family firm supplies the trade throughout Germany, exports specialities worldwide, imports international brands, and continues to make its mark as a quality producer of exceptional spirits. Since 1738, the distiller family Schwarze has had its base In Oelde, today a town with a population of around 30,000 in the rural district of Warendorf. Friedrich Schwarze, who has led the company since 1986, has been able to significantly expand the business. Three years after taking over, he acquired various brands from König & Schlichte, most significantly Original Schlichte Steinhäger, but also brands such as Bärenjäger Honey Liqueur and the Coffee Liqueur Kosaken Kaffee. In 1992 the company Schwarze und Schlichte Markenvertrieb GmbH & Co. KG was founded, and the spirit producer has operated under this name ever since. Schwarze und Schlichte are market leaders in Germany in, for example, the field of Honey Liqueurs and are building on their competence in honey: Bärenjäger Honey Liqueur is available both in the traditional version made with Vodka and more than 200 grams of honey per 0.7 litre bottle (35% vol. ), and as Bärenjäger Honey Bourbon (33% vol.). Here, 175 grams of honey share a bottle with original Bourbon. Only natural flavourings and pure honey are used, underlining the dedication to natural products throughout the company. The Bärenjäger brand is not only highly popular in Germany, but is also the company’s most popular export to a whole range of countries including USA, South America, Australia and Asia. With the classic Bärenfang and Mead (Honey wine) brands, the company combines tradition and modernity in the honey liqueur segment. And with Dujardin Imperial Brandy, Schwarze und Schlichte have a strong market position both in Germany and abroad. 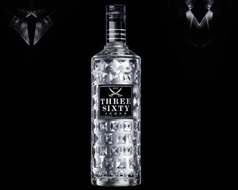 When people talk about Schwarze und Schlichte, the company‘s number one brand always comes up: Three Sixty Vodka. The special 4-times distilled quality, the diamond filtration process and the stylish design of the facet-cut bottle have an air of exclusivity, style and urbanity. And this bestselling premium vodka is a prime example of the complete spectrum of this spirits company – a continuous balancing act between tradition and innovation. 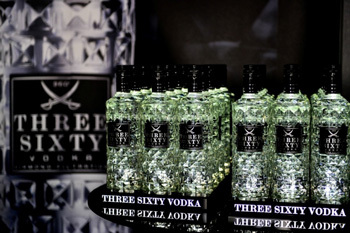 In 2009, Schwarze und Schlichte purchased the rights to Three Sixty Vodka, and has since invested significantly in the brand and successfully strengthened its market position. The first high-reach TV campaign „ONE, TWO ... Three Sixty: Diamond filtrated Vodka“ that ran in mid-2013, was so successful that it will be continued this year, and drew a particularly high degree of attention, contributing significantly to the growth in sales of 57 percent in 2012 and 40 percent in 2013. August 2014 saw the launch of Three Sixty Black 42, a further product under this brand with a high potential for success.